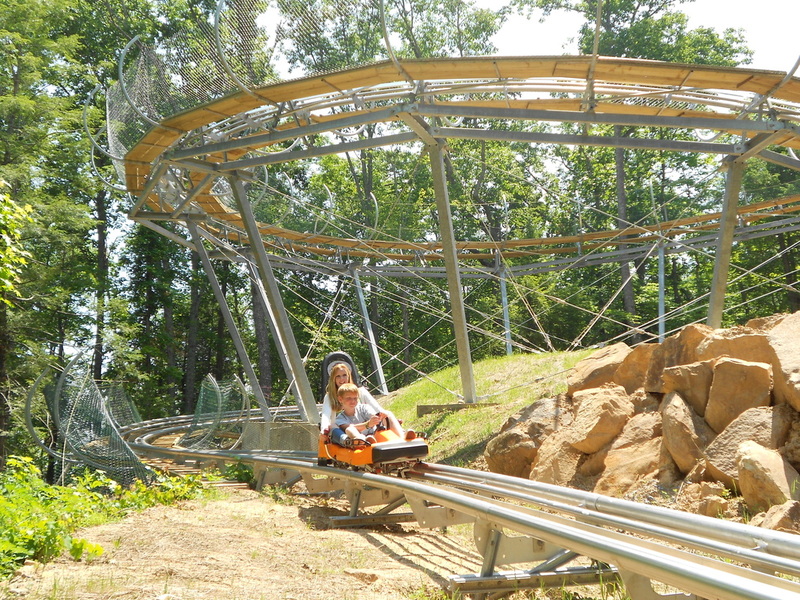 Located just a little over a mile west of the Parkway in Pigeon Forge, the gravity propelled Smoky Mountain Alpine Coaster offers visitors a combination of big thrills, mountain views, family fun, and even a touch of romance for nighttime riders. It was the first mountain coaster in the Smokies (in 2013) and is the longest alpine coaster in the United States. Get a Free Ticket for Smoky Mountain Alpine Coaster when you book a cabin. Call 866 34 SMOKY for details. Relax and enjoy the beautiful Smoky Mountain scenery on the way up as a cable pulls your cart to the top. The five-minute ride up the mountain is serene and scenic, with no sharp twists or turns and great views of the surrounding area. Signposts along the route provide altitude information and caution riders not to stand or bump the cart ahead. An overhead banner at the top displays a reminder on how to use the brakes, and signals that gravity is about to take over. The Smoky Mountain Alpine Coaster lets you enjoy a thrilling ride down the mountain, or take your time and take in some mountain views on the way down, as well. All carts come equipped with handbrakes so that you control the pace. A magnetic braking system also prevents the carts from exceeding a safe speed or colliding with slower riders in front. Carts accommodate one or two people, so the little ones, or more cautious riders, never need to go it alone. First and foremost, however, the Smoky Mountain Alpine Coaster is a “thrill ride,” and a long one at that. Mountain coasters hold a distinct advantage in that they cover more ground and offer longer ride times than traditional roller coasters. Speeds on the way down can reach almost thirty miles per hour, and riders enjoy more than a dozen twists and turns and four switchbacks over the two-and-a-half minute trip to the bottom. Three-hundred-thousand LED lights illuminate the track at night and offer a uniquely different experience from the daytime. Families might find the ride up to the top a bit magical; couples might find it romantic, everyone will find the multi-colored LED lights against the Smokey Mountain night sky exhilarating. It’s well worth it to do both day and nighttime rides if you have the time. Rider Height and Age Requirements. The rider controlling the sled must be at least fifty-six inches tall and sixteen years old. Secondary riders must be at least thirty-eight inches tall with no minimum age requirement. The maximum height for all passengers is eighty-four inches. The coaster also has a weight limit of up to three-hundred-and-seventy-five pounds per sled in dry conditions, and three-hundred-and-thirty pounds in wet weather conditions. Hours. The coaster operates year-round. Hours vary depending on the season but, the ride typically opens early to mid-morning and remains open well into the evening. The ride also stays open through most weather conditions except for thunderstorms and heavy rain. How to Find it. Smoky Mountain Alpine Coaster is located just a little over a mile off the Parkway in Pigeon Forge on Hwy 321, Wears Valley Road.